Nicely adjustable to fit feet! Will go with everything. I love them!! I thought they were tight when I first put them on, but I got them a little wet and walked around and they felt great! 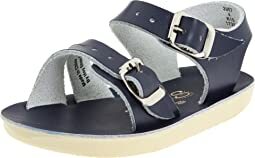 Great sandal and fast shippping. These were for my 11yo daughter and she LOVES them. Even better, I needed sandals. to match a dress last-minute, and was stressing out when my daughter said, try wearing my new sandals, Mom! I loved them and they were super comfortable standing up for 4-5 hours. However, I would not own a pair because my feet hurt later (I have lots of back and feet issues). But I'm thrilled my daughter loves them and that I can borrow them occasionally. They are super cute and go with so much in the rose gold! My daughters have had these shoes in just about every color! My oldest wore hers daily in the summer and they held up so well my youngest can still wear them! They are the best! A comfortable, classic style that can be easily dressed up or down. 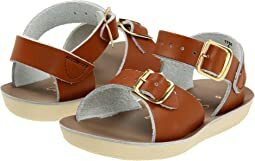 A perfect sandal for kids who hate thong flip flops, plus these are easier for kids to walk and run in! I always recommend these to Mommy’s with young kids! Perfect fit. The best part about these sandals is that they mold to the child’s foot with wear. Purchased these sandals for my 3 yo grandson he loves them and so do I...this is our 3rd year wearing the sun and sand style we love them. Cute sandals. Comfy sole. Nice leather upper. Fits great. My daughter lives in these shoes. A must have for any little girl! I was really excited about these to match my girls’ sandals (which they love and wear all summer). Unfortunately the width of the toe box was too wide for me. I ordered 1/2 size up (usually I’m a 6-6.5 and got the 7). The length was perfect, they were just too wide on top (which I guess makes sense for a unisex shoe). Love these sandals. They are comfortable and stylish. Very fast delivery! My daughter loves her new sandals ? These shoes are adorable! The color is great, and the style is nostalgic of what I wore when I was little! After trying then on, the straps are stiff and not very comfortable - I am afraid they will rub my feet wrong and give me blisters. Definitely not comfortable on the first wear. Hopefully they loosen up after a few wears. These sandals are so classy! They are great for both my 7 year old and my 3 year old daughters. The quality is amazing and I can always keep the 7 year olds to pass down to my 3 year old. Wonderful kid shoes! Awesome fit, adorable style ? Every spring/summer I buy my daughter a new pair of these sandals. I love the brown, they will go with everything. There is nothing cuter than a toddler foot in a salt water sandal! The best. These shoes seem to run a little big in length. Width is easily adjustable. They are super cute and my daughter loves the rose gold color. They go with so many of her outfits and can be dressed up or worn with everyday outfits. Very happy with this purchase. 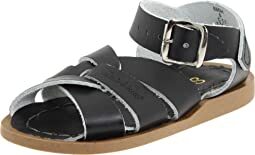 Friends at work turned me on to this cute, comfy and reasonably priced brand of sandals, and when I went to Zappos and saw the rose gold ones, I ordered immediately in what I thought would be my best size. They were a tiny bit loose, and I felt my foot moving in them, yet they were comfortable and stable enough for quite a bit of city walking (flat ground/sidewalks). But I started to wonder if a size down might be better, since there is so much talk re: size on this shoe. Hopefully the pictures will help people determine what is best for them, as "perfect fit" is not the same for everyone. I wear a size 6-1/2 shoe, 36 Euro in nearly every brand I've ever worn. I have somewhat duck feet, so a little wide at the front with a narrow heel. I ordered my rose gold Salt Water sandals in size 5/W7. You can see how my toes don't hit the stitching. 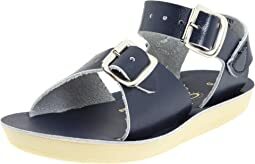 I ordered the navy blue sandals in size 4/W6. My toes come almost to the edge of the sandal, but there is absolutely no overhang at the toe or heel. The straps of the shoe fit my foot much more snugly, which for me means that I would be more likely to dance or make quick turns in them. 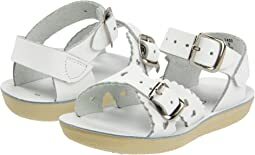 My feet feel fully supported and stable, while the larger size sandals could potentially contribute to a twisted ankle if I tried too much fancy footwork in them. Also, personally, I don't like the way so much of the shoe is showing in the toe area. I prefer the toes coming closer to the edge, but again, this is where everyone is different. Some might prefer the looser look and feel, but I think it's important to know that a person can successfully wear two sizes and have them both technically fit, just in a different way. For the record, both of my friends who wear the Salt Water sandals wear them as my feet appear in the larger sandal. I can literally see their feet moving around within the sandal as they walk, but they prefer that fit. Hope all this helps! The best summer sandal ever. My toddler daughter never fussed to wear these and they clean up beautifully. Practically an indestructible shoe.